CyKick Aerosol is a Crack & Crevice Residual insecticide that offers a fast knockdown of insect pests. Cy-Kick "residual" means that the aerosol leaves a film that keeps on killing for weeks. The aerosol formulation of Cy-Kick is designed for residential and commercial applications where crack and crevice, spot and void treatments are needed. The low odor formulation of Cy-Kick Aerosol makes it a perfect application choice for indoor residential treatment sites, food handling and sensitive areas. Cy-Kick Aerosol is labeled for many common pests typically found in and around structures, including spiders, bed bugs, ants, roaches, beetles, centipedes, millipedes, scorpions, earwigs, boxelder bugs, silverfish, pantry pests, and more. Both Cy-Kick Aerosol and Cy-Kick CS Aerosol contain the same amount of Cyfluthrin, however the CS Aerosol formulation has more of a foaming effect and has different labeling due to the micro-encapsulated formulation. Be sure to read the product labels to determine which product is best for your application needs. 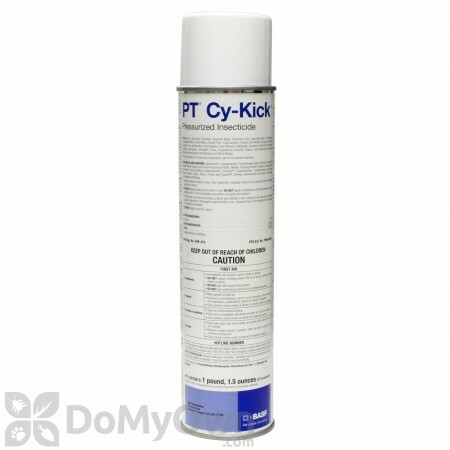 Cy-Kick Aerosol is a ready-to-use pressurized insecticide with the active ingredient Cyfluthrin. Cyfluthrin is a synthetic pyrethroid made to mimic the effects on insects of naturally occurring pyrethrins, which are derived from the Chrysanthemum flower. Cyfluthrin attacks the central nervous system of target pests that come into contact with the direct spray or dried residual of Cy-Kick Aerosol. Cy-Kick Aerosol is designed for residential and commercial accounts where applications for crack and crevice, spot and void treatments are needed. The effective control of Cy-Kick Aerosol can be utilized in sensitive environments such as restaurants, office buildings, nursing homes, hotels, in public areas and for perimeter treatments where drift may be a concern. This ready-to-use aerosol product is a convenience that everyone with time constraints can appreciate. Spot and localized perimeter applications can be treated quickly, reducing the need for expensive application equipment and eliminating mix and measure products. Residual lasts for up to six weeks. Cy-Kick Aerosol is an easy-to-use treatment for control of many common pests, including ants, roaches, silverfish, boxelder bugs, carpenter bees, millipedes, scorpions, spiders, wood wasps, and spot treatments of wood-destroying pests. Plus, Cy-Kick Aerosol can be use in food and non-food areas of food-handling establishments and on modes of transport. Do not use Cy-Kick Aerosol on plants or on sensitive surfaces that have been varnished or painted. Both Cy-Kick Aerosol and Cy-Kick CS Aerosol contain the same active ingredient, however Cy-Kick CS Aerosol will have more of a foaming action and is labeled for different applications. For example, only Cy-Kick Aerosol is labeled for wood-destroying pests. Use with the supplied actuator and injection tubes or other aerosol equipment. Inject into cracks and crevices or void spaces where insects may be harboring, living and breeding. Place injector tip into cracks, crevices, holes, and other small openings. Release approximately 1 second of product. Move injector tip along cracks while treating at a rate of 1-3 feet per second, depending on level of infestation. In closed voids, treat at the rate of 1-5 seconds/3 cubic feet. Several holes may be required in long-running voids. For spot treatments, use with the supplied actuator and injection tubes or other similar equipment. Hold container upright while spraying. Direct nozzle approximately 12” from surface to be treated. Apply directly on insects in these locations when possible. Wood Destroying Insects Indoors and Outdoors: Cy-Kick Aerosol can be used to treat localized areas for wood-infesting insects such as beetles and borers, carpenter ants, carpenter bees, termites and wood wasps. Locate suspected infestation and/or insect tunnels and cavities. Drill pilot holes into insect tunnels, galleries and inaccessible closed voids. Drill holes 8-10” apart to ensure thorough coverage. Inject 5-10 seconds per hole. This treatment is for localized termite infestations only, to kill workers or winged reproductive forms which may be present in the treated channels at the time of treatment. Yield will vary with user and application needs since this is a ready-to-use product. In and around apartments, campgrounds, food storage areas, homes, hospitals, hotels, meat packing and food processing plants, motels, nursing homes, resorts, restaurants and other food handling establishments, schools, supermarkets, transportation equipment (buses, boats, ships, trains, trucks, and planes (do not apply in aircraft cabins)), utilities, warehouses and other commercial and industrial buildings. Crawling Insects: Apply as crack and crevice or void treatment where insects may be harboring. These may include openings around pipes and sinks, under refrigerators, behind baseboards, washing machines, stoves, cabinets, sewers, floor drains, and meter boxes. Spot treatment may also be made to areas including closets, around water pipes, doors and windows, around refrigerators, cabinets, sinks, stoves and other equipment, shelves, drawers and similar areas. Bed Bugs: Apply to cracks and crevices where evidence of bed bugs occurs. This includes bed frames, box springs, inside empty dressers and clothes closets, carpet edges, high and low wall moldings and wallpaper edges. Do not use this product on mattresses, pillows, bed linens or clothes. Remove all clothes and other articles from dressers or clothes closets before application. Allow all treated areas to dry thoroughly before use. Not recommended for use as a sole protection against bed bugs. If evidence of bed bugs is found in/on mattresses use products approved for this use. Food Handling Establishments: Use only as a crack and crevice, void or spot treatment. Apply to different elements of construction, between equipment and floor, openings leading to hollow spaces in walls, equipment legs and bases, and where insects hide or rest. Cover exposed food or remove food from premises. Do not apply directly to food. Avoid treating surfaces likely to be contacted by food. Reapplication may be made at 10 day intervals. Limit individual spot treatments to no larger than 20% of the treated surface and not more than 2 sq. ft.
Perimeter Treatment: For crawling insects, apply as a crack and crevice or spot treatment into cracks and crevices where insects may enter premises or harbor. Areas to be treated may include weep holes, under siding, wall voids, soffits, around attic vents, cracks and crevices and openings around windows, doors, and pipes. Treatment of infested fences and tree holds is permitted. Active and Hibernating Stages of Boxelder Bugs, Elm Leaf Beetles, Cluster Flies, and Clover Mites: Apply into cracks and crevices or voids where these insects may be harboring or hibernating. Infested areas may include cracks and crevices, behind siding, wall voids, around window and door frames. This product may also be used to treat subterranean ants, termites and carpenter ants living inside trees, aerial termite cartons in trees, termites and carpenter ants in stumps, utility poles and fences, and in-ground service boxes. See product label for details. Ventilate treatment rooms before returning patients or allowing children or pets to enter. Spray may damage plant foliage. Do not apply directly to plants or in a manner in which spray may drift onto foliage. Do not store or use near open flame. Do not expose to temperatures over 130 degrees F.
Do not spray on plastic, painted or varnished surfaces as staining may occur. Spot test in an inconspicuous area. Do not apply directly onto any electronic equipment. Reapplications may be made in 10 days, if needed. Last year I had to get let go of my pest control company because they would only show up when nobody was home and thus the inside of my house would never get inspected or serviced. I found out that my company's pest control service uses Cy-Kick Aerosol in our workplace. I bought it from DoMyOwnPestControl.com (thank goodness that they sold it, since I could not find it anywhere else). This product works great. It takes me less than 45 minutes to perform my own inside service and my results are better than when I used a pest control company! Had pantry moth infestation for almost a year now and cleaned out my pantry twice. Finally bought the traps and this aerosol and followed the directions and I have only seen and killed 3 moths. My trap had none. What I love is that the spray with the long nozzle is very powerful and very accurate so it was very easy for a short person to spray even where I couldn't reach. No odor noticed and I don't know if I did a great job cleaning up or if this spray did its job BUT this is a MUST buy after if you want to stop the cycle. National pest control company used this product to kill spiders outside. I have tons of spiders around the doors. I would walk out the door and walk though spider webs. 30 mins later the webs would be rebuilt and I would walk through them again. Spiders were bad, but Cy-Kick aerosol did the job. Not one spider has been seen since. I decided to DoMyOwnPestControl and ordered this product. Spider free for now! The residual effects of this product is excellent. Had a friend give me a can of cy-kick to get rid of termites & other critters. Worked really well. Then I bought two cans from 'do my own pest control' & already used one can and starting on the second. All my bugs went to my neighbors house's cause my house is bug free. Is Cy Kick Aerosol safe to use next to pregnant women and infants? When used according to the product label, Cy-Kick aerosol is safe to use around infants and pregnant women. It is important that everyone is out of the area during the application. Everyone is free to return to the treated area as soon as it is dry. What product or procedures will get rid of bugs in my rice and pasta products? I live in Florida and have a have a food storage pantry that I have typically stored rice, spaghetti, lasagne, and noodles in. I discovered bugs in my rice a few months ago, and soon found the same bugs in all my pasta products. I threw everything out, bought new products, and the bugs were back in everthing within days. I have since used or thrown products out again, and am buying in small quantities only and using product quickly, but still have the bugs from time to time. I can't get rid of them and they must be still in some products. I am worried that they could find their way through the house to my kitchen pantry. I use Taslstar P on a regular basis for my home protection, but obviously don't spray my shelves and food, only the baseboards. I need some suggestions on what to do or use to get rid of these bugs. For pantry beetles or weevils you should remove everything from the cabinet, inspect every item, discard anything that is infested. Next you should thoroughly vacuum all cracks in the cabinet. Last, you can apply a product such as Cy-Kick Aerosol to all of cracks and crevices in the cabinet to help kill any hidden pupa as they emerge so that they cannot continue to re-infest products. After the cabinet has completely dried you can put food products back in the cabinet. 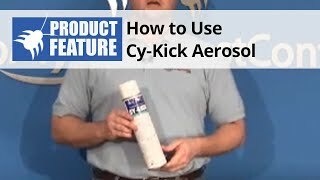 Can this Cy Kick Aerosol be used indoors around small pets? I have a small dog and will take her to a neighbors house when i spray but will it be safe for her after the product has dried for an hour or two? Yes. Cy-Kick Aerosol can be used in a house where animals live, the animals just need to be out of the area that is being treated, and they can return as soon as the treated area is dry. How do I determine the manufacture date of BASF chemicals? What do all the numbers mean? BASF uses a unique set of numbers to match up that product, when it was made, what lot it was a part of and how many were in that lot. Below you will see an example of a Cy-Kick aerosol can and how it is broken down. The batch numbers can vary in location on BASF products from just above the label on a bottle, to the bottom of a container or can, as well as on the sides of case containers or boxes. Starting with the first row. The first set of numbers normally starting in 59- ex: 59011782 is BASF's article number for the product. The third set- ex: 111, indicates the numerical day of the year that the product was produced. So it was manufacturer on the 111th day of the year of 2015. This comes out to show it was produced on April 21st of 2015. The bottom row of numbers indicates the batch information. The first set- ex: 203923930, indicates the actual batch/lot number for the manufacturer. The second set- ex: 28570 indicates the container count of each batch. What does the "CS" on Cy-Kick stand for? I have a 20 oz aerosol can of Cy-Kick CS. When I search for that product it comes up with the concentrate that you have to mix. Also, I can't find it in 20oz cans online. CS stands for "capsulated suspension" or microencapsulated solution. Microencapsulated products last a little longer than the normal version but are really only beneficial when used outside in direct sunlight or an area where there may be a lot of moisture. 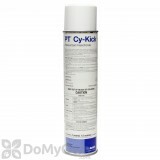 The Cy-Kick CS version of the Cy-Kick aerosol that you are looking for is much more expensive. Since most people use this product indoors, we have chosen to only offer the Cy-Kick aerosol version instead of the Cy-Kick CS aerosol version. Both Cy-Kick aerosol and Cy-Kick CS aerosol have the same amount of active ingredient, Cyfluthrin .1%.